This first article focuses on Seattle’s original upscale grocer, Augustine & Kyer, which itself started off as Charles Louch, grocer. Augustine & Kyer, known familiarly as A&K, was the eldest of the stores at the genesis of Tradewell. Stone & Burnett, wholesale and retail dealers in dry goods, groceries, clothing, hardware, ship stores, and general supplies, Commercial [Street]. Kinnear said that the Haley & Wright grocery succeeded Stone’s. In 1885 Charles A. Wright worked at the Corliss P. Stone grocery store as a clerk. John Haley and Charles A. Wright first appeared together in the 1887 city directory where they described themselves as selling “fine groceries”. The partnership didn’t last long. In 1890 Haley was in partnership with John Glenn as Haley, Glenn & Co. He had his own Haley Grocery in 1892 and then joined Seattle Grocery in 1893 where he became president. That lasted until apparently L. C. Wheeler bought out Seattle Grocery in 1900. Haley left to join Louch, Augustine & Co. as a salesman. Wright was already there waiting, an employee of Louch, Augustine & Co. since at least 1897. Kinnear’s memory was that Louch, Augustine & Co. replaced Haley & Wright. Frankly I haven’t found evidence of a corporate connection from Hinds, Stone & Co. to Haley & Wright or from there to Louch, Augustine & Co. Certainly there was some continuity with Charles A. Wright moving between all three firms, and his visible position as a clerk may have seemed familiar to customers. The earliest corporate predecessor to Tradewell — certainly the earliest with evidence — was Charles Louch’s store. Louch opened his store in 1885 at Front Street (now First Avenue) and Union Street, just south of the present-day Showbox. (I am trying to resolve conflicting sources on his arrival in Seattle but believe he arrived in 1879 and soon after had a store at about First and Cherry.) By 1888 he had a farmstead on the east side of Beacon Hill overlooking Rainier Valley which he named Cherry Hill. Today the family home would be adjacent to the power line route just south of Othello Street above New Holly. Tragically the home interior burned in 1934 including all of Louch’s furnishings. In aerial imagery from 1936 the house is still present with what appear to be orchards surrounding it to the north and east. Paul Dorpat wrote the only anecdotes that I’ve found so far about Charles Louch’s store. 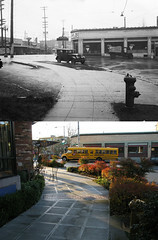 In a 2005 Seattle Times Now & Then article, the old photograph showed Princess Angeline in 1891 near First and Pike. Dorpat pondered that perhaps she was walking from her waterfront home to Charles Louch’s grocery at First and Union. The Board of King County Commissioners had given her an open tab at Louch’s shop in case she should need any food or provisions. That was more than a decade before the Pike Place Market opened, but as Dorpat shared in essay 34 of Now & Then Volume 3, Seattleites were already flocking to the area for food because of Louch. By 1890 Louch’s ham smoking and wholesale distribution were so successful that nine of ten Seattleites ate Louch’s 1888 brand ham and bacon. Louch’s retail grocery store and wholesale operation were each the largest in Seattle. Per the Polk Guides, in 1892 Louch partnered with M. B. Augustine and T. W. Miles to spin off his wholesale business and form Louch, Augustine & Co (LA&Co). Manuel (sometimes “Emanuel” or “Amanuel”) Brock Augustine was an experienced grocer and mining supplier. Through the 1870s he was part owner of a general merchandise and mining supply store in Silver City, Nevada. By 1881 he was a traveling salesman based in Oakland, California. From about 1883 until he moved to Seattle in 1892, Manuel was a traveling salesman for J. A. Folger & Co, the San Francisco coffee maker that today we simply call Folger’s. Perhaps then it’s no surprise that LA&Co counted freshly ground, fine quality coffee as one of their strengths. Seattle Grocer Manuel Brock Augustine in about 1903. From Sara McMullen’s family tree on Ancestry.com. (Full Size) MOHAI has another photo which was incorrectly labeled as J. W. Augustine. After Louch ran his retail store alone for one more year, it too became jointly owned by LA&Co in 1893. Their store moved into expanded quarters in the Colman Building on First between Marion Street and Columbia. The wholesale business blossomed in 1897 with the Klondike gold rush, when Augustine’s experience in Nevada and Oakland helped LA&Co position themselves and their bacon as perfect for high-end miners. LA&Co had both wholesale and retail arms until the wholesale business was sold in 1902 to Portland’s Julius Lang. He merged it into the National Grocery Company. This reduction in business scope coincided with Charles Louch returning to England and dropping out of the Seattle scene and out of history books. M. B. Augustine’s son Julius Webster Augustine joined the firm by 1894 at the age of 16, just in time to experience Seattle’s boom after the Klondike gold rush. Julius worked as a clerk at Louch, Augustine & Co, went to Alaska himself for three years, and returned to work a time at National Grocery. When Charles Louch left for England in 1903, Julius took over management of one department. When Louch and then his father sold their interest in the firm, J. W. Augustine was vaulted into the position of vice-president in 1908. As Louch exited, Henry Anderson Kyer entered the company. Kyer was graduated from the University of Michigan and came to Seattle in 1889. He was accountant for rail and steamship heavyweight Oregon Improvement Company in their Seattle office and in 1895 became a freight and ticket agent. That year he also had the good fortune of marrying Alice Emma Augustine, daughter of M. B. Augustine. Kyer stayed out of the family business for a number of years, going to work next for the Chicago Great Western Railway as their Seattle agent. After Charles Louch returned to England in 1903, Kyer used his freight knowledge, bookkeeping skills and family connection to become vice president of Louch, Augustine & Co. Four years later the family bought out Louch and other partners. Photo and Cartoon from the book The Cartoon, A Reference Guide of Seattle’s Successful Men, page 133. Available through Internet Archive. In 1907 the remaining retail business was renamed Augustine & Kyer (A&K) with the very modern tag-line “Pure Food Purveyors”. H. A. Kyer became president with J. W. Augustine as vice-president. They remodeled and expanded their Colman Building location into what they described as the largest grocery on the Pacific Coast outside of San Francisco, almost an acre of floor space. 120 people were employed at the time. A&K had nineteen operators staffing their phone lines so that they could handle all of the delivery orders. They phoned customers daily to see what was needed for dinner. A candy factory and bakery were built in the Colman Annex, just west across the alley from the main building. It was on the top floor, over the Mayer Brothers clock factory. A&K’s chocolates and candies were very successful and sold not only at their own stores but also at most drug stores and cigar shops throughout the city and region. The fanciest of them sold at Christmastime in wood boxes imported from Japan and inlaid with mother of pearl. Others shipped in boxes with images of Mt. Rainier on the outside and postcards of Seattle scenes inside. Today Frederick & Nelson is remembered as Seattle’s great candy retailer and manufacturer with their eponymous Frango. However A&K predated them and F&N only took the mantle as local king of candy as A&K’s retail business fell apart during the Great Depression. The two candy lines were in direct competition for more than four decades. While F&N’s Frango lives on at area Macy’s stores, A&K’s candies are nearly forgotten. Luckily MOHAI holds a photo of two women dipping chocolate at the factory in 1913. In contrast, the Frango candy wasn’t developed until 1927. In 1908 M. B. Augustine sold his share of the company to his son Julius and to Henry Kyer. Soon after Julius took over as vice-president, he began expanding the business with Kyer from its single Colman Building location. By 1910 a store was open on Queen Anne Hill. By 1914 stores in the North Broadway and Capitol Hill neighborhoods were added. The North Broadway store did not last long, and was abandoned by 1922. Expansion took hold again in the mid-1920s with a fourth store in the University District and one near the Westlake Market (now Westlake Mall). Within a year of the new corporate structure, Henry Kyer divorced Alice Augustine. He remarried in late 1909, and she remarried in 1910. The end of their marriage didn’t stop Henry and Julius from doing business together, though. Julius remained involved in day-to-day affairs until about 1915 when he moved to Monroe, Washington. While continuing to act as vice-president of A&K, Julius opened a grocery store there. In 1929 he left A&K management, moved to Oakland, California and started a new grocery store of his own. Because Augustine & Kyer has been so thoroughly forgotten, its downfall is not completely clear. Like many businesses, A&K accumulated too much debt during the Great Depression. At some point they fell into the possession of their food distributor, Pacific Fruit and Produce. In 1938 the Queen Anne, Capitol Hill and Westlake stores were closed, leaving only two stores in the Colman Building and University District. In 1939 Henry Kyer left A&K and moved with his third wife to the Olympic Peninsula to manage an inn that they purchased. Later that year Pacific Fruit’s parent company Pacific Gamble Robinson hired veteran grocery executive Monte L. Bean to manage Augustine & Kyer, Eba’s Mutual Markets, and other Seattle-based stores mostly in the Puget Sound area. Bean renamed them as Tradewell Stores. All that survived was the candy factory in the Colman Annex. It was purchased by Horace W. Heath. Heath was a former A&K salesman who started his own general store on Mercer Island. He successfully managed the Augustine & Kyer chocolate business until his death in 1949, and it continued selling to local drug stores and groceries for almost a decade without him. A&K disappeared from the city directories by the late 1950s, and remembrances in the Seattle Times became few and far between. The famous 1888 Hams, imported delicacies, locally-produced candies, the roasted, ground and pulverized coffee, the daily calls and deliveries — they were all forgotten. Hello, do you have photos or info about the Tradewell store on NE 15th and Fremont in Portland? Sorry, I don’t have any. Have you tried your city and state archives? Do you know the address for the Tradewell in Port Angeles WA? My grandfather told me stories of Augustine and Myer and that his dad had many good memories working there. I am not sure at what capacity but they were the first grocery store that delivered. My grandfather passed recently and I inherited photos of inside the store and various logo drafts for the store. He said there were many locals who raved about the imported cheese and how it was anticipated and celebrated yearly. The chocolates that were made came from one of our family recipes and after the fire destroyed the store not many people recovered or rebuilt.